Highly desirable, well-located home just steps away from beautiful Alta Plaza Park and one block from wonderful Fillmore Street shopping and dining. The home features a handsome façade in the French mode with mansard roof, decorative dentil pilasters & cornices and double capped bay windows. At street level are driveway tiles laid in a herring bone pattern and attractive in-ground planters with colorful blooms. The east facing rooms look out to the handsome arched Gothic entrance and facade of the prestigious cooperative apartment house at 2500 Steiner Street. The FOYER introduces the fine architectural detailing found throughout the house including: beautifully proportioned rooms with abundant natural light, tall ceilings, decorative crown molding, fluted wood trim, arched doorways, and refinished hardwood floors throughout. The warm and inviting LIVING ROOM features a wood-burning fireplace with ornamented mantle & marble hearth and floor-to-ceiling bay and side windows. The elegant formal DINING ROOM, also with floor-to-ceiling bay and side windows, can seat a large dinner party of ten or more. Alongside the sunny BREAKFAST AREA are additional glass front cabinets for glass & stemware and a long marble top for food service to the dining room. The main floor BEDROOM can serve as guest or au pair quarters or as an at-home office; the elevator is accessed from this room. The adjoining marble BATH with shower also serves as the guest bath. Ascend the staircase to the bedroom level. French doors open to a small arched porch off the landing. The spacious MASTER BEDROOM features a walk-in dressing room with built-in storage and MASTER BATH with marble surround, deep tub, separate shower and handsome marble vanity. The second BEDROOM has delicate plaster floral & bead frieze work on the ceiling. The third BEDROOM features a Pullman dressing room to the shared BATH with tile surround, deep tub, separate shower and vanity with skylight overhead. French doors open to the small porch. The elevator is accessed from this room. 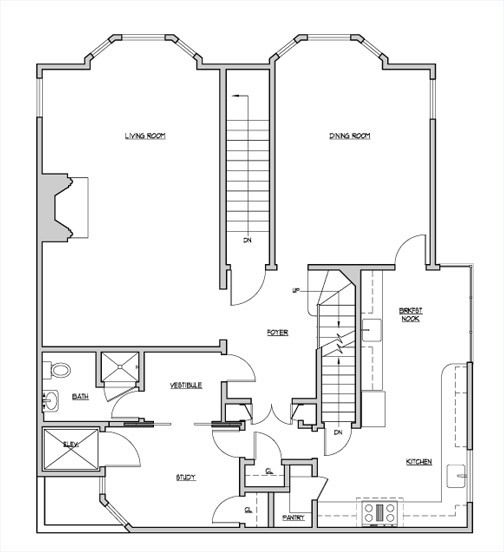 Ascend the staircase or take the elevator to the wonderful top floor FAMILY ROOM which is the heart of the house for relaxation and informal entertaining. It features a charming brick corner fireplace, expansive built-in bookcases and west outlook to the gardens of surrounding homes. Step out to the expansive, private ROOF GARDEN to enjoy the northeast bay views and alfresco dining in the sunshine. The 'garden' is artfully landscaped with espaliered planter boxes & potted plants. A convenient HOT HOUSE/POTTING ROOM with sink opens from the roof garden. Inside access from the two-car GARAGE or trades entrance. LAUNDRY ROOM with washer/dryer, utility room, ample work and storage space. Security System, high speed networking capability, and more custom features (see attached Special Features). Structured Wiring: 2511 Steiner Street has been fully updated throughout for high speed networking capability. Offering scalability and reliability for convenient computer networking and internet access, the Category 5e structured wiring infrastructure has been designed to anticipate future needs as well. All network ports are connected directly to a main distribution center in a command-center configuration, with RJ-45 patch cables completing the wiring to a Gigabit Ethernet switch. Telephone Sytem: 2511 Steiner Street comes complete with an advanced telephone system designed to maximize at-home communications. With a wide array of features, it offers the full functions of a telephone system and an intercom system. Capabilities include the ability to assign specific lines to each phone, place intercom calls room to room with the touch of a button, forward calls to outside locations, monitor a room, page extensions, enjoy conference calls, and more. The telephone system comes with full featured voicemail capability, including an auto attendant. Music System: The centrally located media closet is equipped with a Harmon Kardon tuner and amplifier system that is integrated with a media computer that features a flat panel display used to quickly browse a music lover's library. New music can easily be added from CDs, downloaded from music sites like Apple's iTunes, or streamed from the Internet. High quality speaker cabling distributes the audio to the living room, dining room, and kitchen. 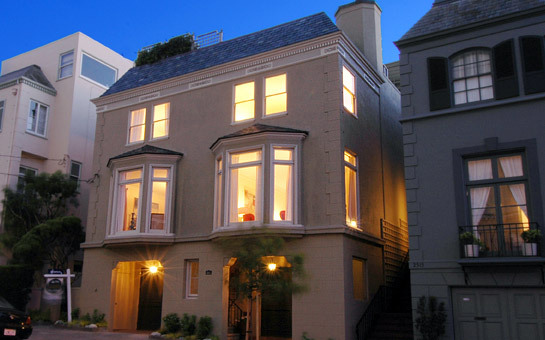 Heating System: 2511 Steiner Street has been upgraded to offer the latest in heating system technology, and offers a multi-zone configuration. Individual high efficiency furnaces for each floor of the primary living areas provide the maximum in comfort inside the home, and a state of the art control system accurately predicts the need for heating while cutting temperature swings in half. The system also includes HEPA (high efficiency particulate air filter) filtration capable of removing at least 99.97% of the most difficult to filter airborne particles. Water Filtration System: 2511 Steiner Street features a custom water filtration system that is completely integrated into the kitchen's cold water supply. High speed control valves source water from the commercial grade water filtration system by simply flipping a switch. Water pressure and flow is not compromised, and filter life is maximized with this system. The commercial grade filters not only enhance the water's taste and remove cloudiness, but also serve to remove health risks like lead, chloramines, MTBE, and other volatile organic compounds.